Modern clothes and technology should not exist in Pooh's world. And expedition to the North Pole should not end at the literal North Pole. The characters should not be famous. New characters should rarely, if ever, be added. If you're ostensibly using the basic designs and voices of the original Disney classic, the whole thing probably shouldn't be rendered in crappy CG. The plot of this thing... God. It's just... what the hell were they thinking? Roo and his elephant friend find a young talking reindeer and a seemingly empty sack, which is of course Santa's. They decide to help the reindeer get back to the North Pole, so Christmas doesn't have to be canceled. They enlist the help of the Super Sleuths: the aforementioned team consisting of Darby (Christopher Robin's replacement), Pooh, Tigger, and Darby's dog (I guess he's filling in for Scooby-Doo). A few other characters go with them, but I don't think they're technically "Super Sleuths." They proceed to walk to the North Pole. There are several obstacles along the way, but nothing that deserves description. They reach the outskirts of the North Pole after a few hours and meet a bunch of singing snowmen. The snowmen lead them the rest of the way, and they meet the reindeer's parents and Santa. 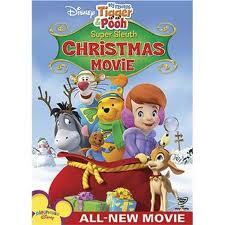 Christmas is saved, Eeyore fills in as a reindeer, and everyone is happy. Unless you like Winnie the Pooh. If that's the case, you're probably in tears at this point.